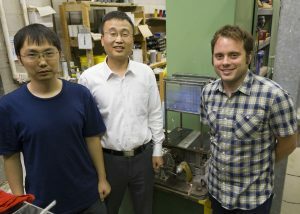 “How can you multi-purpose—re-think—structural systems?” Iowa State University (ISU) researchers have a new theory to answer that question. Earlier this month, the Civil, Mechanical and Manufacturing Innovation (CMMI) Division of the National Science Foundation (NSF) awarded ISU professors An Chen and Simon Laflamme more than $200,000 in research funding. The project, “Multifunctional Structural Panel for Energy Efficiency and Multi-Hazards Mitigation,” will explore the use of Tuned Liquid Wall Dampers (TLWD) as a multi-functional structural system. Tuned liquid damper systems reduce wind and earthquake vibrations in structures like bridges and tall buildings. 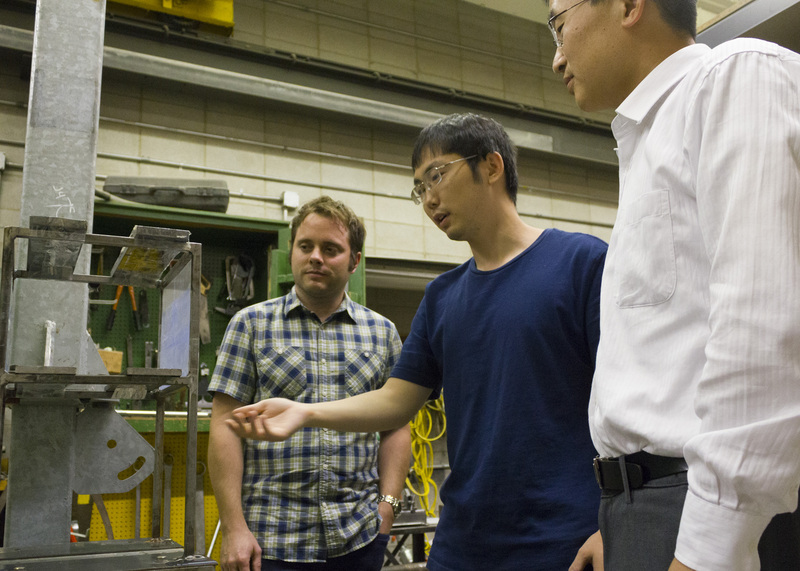 Chen is the principal investigator for the project and an assistant professor in ISU’s Department of Civil, Construction and Environmental Engineering (CCEE). Currently, tuned liquid column dampers (TLCD) are more commonly used. Both researchers outlined how the use of TLCD is often limited to commercial buildings. That’s due in part to the design of residential properties, the need for structural support for the TLCD system, and the overall cost of installation. The study of TLCD systems is where Chen first got an idea for the project’s theory. Laflamme is an associate professor at ISU CCEE. He saw an opportunity in TLWD research. “We would be investigating its semi-active use for the first time (semi-active TLWD), which means that we will purposefully control the flow of water through the TLWD to improve on damping performance,” Laflamme explained. Chen says TLWD systems would differ from their TLCD system counterpart in major ways. TLWD would eliminate the weight from the top of structures. His and Laflamme’s theory suggests this would improve performance during excessive vibrations due to seismic events. The design of the TLWD system would make it usable for both residential and commercial buildings prone to vibrations. That new design is what makes the system unique. 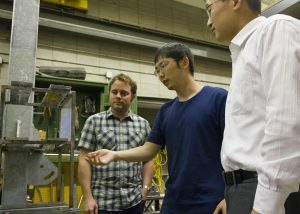 “We’re going to have a series of valves that open and close in the wall, and we’re going to develop a theory on how to actually manipulate these valves to be able to leverage the masses of water that circulate through the wall to reduce vibration,” Laflamme said, explaining the capillary system on which the TLWD concept is based. Their work won’t stay in the lab. Both professors plan to incorporate this research in classes. Currently, Chen and Laflamme have planned integration of this project into Civil Engineering (CE) 332: Structural Analysis I at ISU. They also plan outreach to local schools. The project is a partnership between ISU CCEE and the University of Alabama. It has an estimated end date of July 2019. For more information, visit “Multifunctional Structural Panel for Energy Efficiency and Multi-Hazards Mitigation.” Make sure to keep up-to-date with the latest ISU CCEE research by following us on Facebook, Twitter, and on LinkedIn (search Iowa State University Civil, Construction and Environmental Engineering and ISUConE). And visit our website at ccee.iastate.edu.